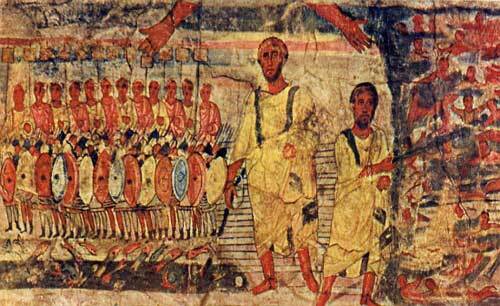 Fresco of Moses and the Exodus, from the Dura Europos synagogue. Photo © Richard Beck. UPDATE: See 2013/5773 Passover post here. This year, Passover begins at sundown on April 6 and ends at sundown on April 14 . These are some listings for sederim, Kosher food products, and catering in Rome for Pesach 5772. For more information on sederim and services, contact Rome’s Rabbinical Office at +39.0668400651, +39.0668400652, or ufficio.rabbinico@romaebraica.it. And could you please tell me where I would pick up or I guess eat there, at the Jewish Community of Rome prepared Pesach meals. Where is this located? I will be in Rome the beginning of April. Also, any community seders that aren’t Chabad that let visitors to Rome share in their seder?